Sign up now and list your restaurant on the best restaurant site in South Africa! As South Africa’s premier domain we bring you a site that surpasses all others. The strength of our domain It’s Simple - It’s Direct, It’s Targeted, and it Works! Simple to Use It is so easy to manage your listing. We give you all the power to promote your restaurant in the manner you choose! 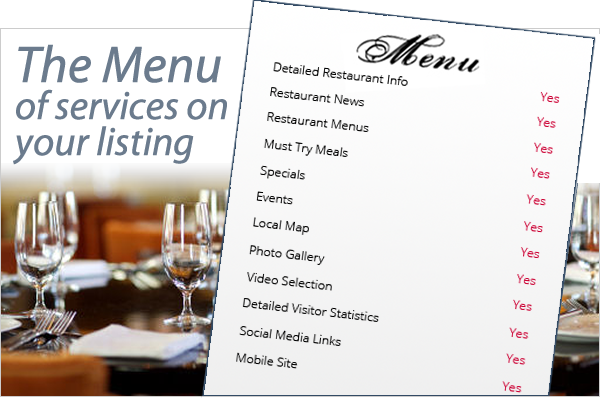 Keep it Updated Keep your restaurant’s details updated by logging in, or call us to update them for you. You can update every element of your page, including all text, pictures, menu’s, specials, events and videos. Specials and Events You can add up to 5 Specials/Events at a time. These specials have automatic expiry dates to keep them current, and on/off switches to use them as needed. Your specials/events will be advertised free of charge throughout the website. Prices to join are per month (excl VAT), and all inclusive. Discounts are offered to franchises with more than one restaurant. Please email webmaster@restaurants.co.za for a quotation. Restaurants.co.za has been developed so that it is easy for franchises to load details and keep information up to date through one account. Loading of free advertisements is easy for all outlets. If you are unsure about your area and which price bracket it falls into, please ask for a quote. Our service contract can be read here.